Welcome, fellow traveler! 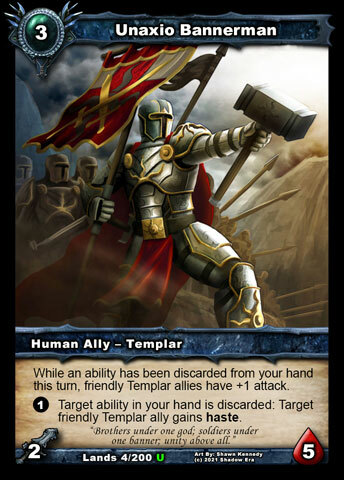 The aim of this article is to give you the complete set of rules associated with our new card type, Location, which was unveiled in our Announcement of the Lost Lands set on July 1st. It was great to see so much excitement and speculation about how our new card type will work, just from that one spoiler, but now it's time to hopefully remove the speculation and increase the excitement, with the full rules for Locations and three new spoilers! Location cards go in your deck. You can choose to run no Locations at all or up to 4 of each. Part 1 of Lost Lands will include 15 Locations. The complete 200-card set will have 20 Locations in total. Locations are played in the centre of the board between the two ally rows, in a single stack, shared between all players. At the start of the game, the stack is always empty. All Locations in the stack are considered in play, but only the top one is active, meaning that the text on all the covered Locations is effectively blank. When a Location is summoned while there is already an active Location, the active Location immediately becomes inactive and the newly summoned Location takes its place on the top of the stack as the active Location. Locations have no summoning cost, so they effectively play for "free" (even in presence of cards that increase summoning cost). Locations always have a Turn Number associated with them, which denotes the earliest that the Location can be summoned. In other words, for a Location to be summoned, the current turn number for the active player must at least match the Turn Number on the Location (e.g. 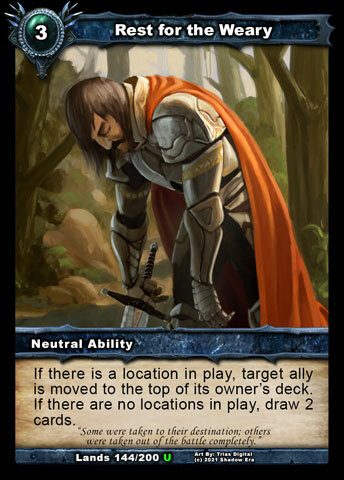 T2 means the active player must be on their 2nd turn or later). A player may not summon more than one Location per turn. 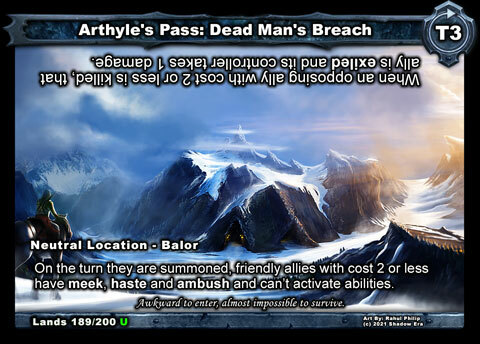 To help players adhere to these two requirements, within the digital game, a Location card will not be highlighted in your hand before its Turn Number requirement has been met or if you have already summoned a Location that turn. A player may add a new Location to the stack even if their own is currently on top. Locations have two separate ability text boxes, with each considered speaking to the player it is closest to (or the team it is closest to, in the case of 2 vs 2 play). Text for the opposing player(s) is written "upside down" to facilitate this. Each ability text box can have passive abilities and/or activated abilities. Each activated ability on a Location can only be activated once per turn. As with every other card in Shadow Era, each Location has exactly one controller at all times, which is the player who summoned it by default. 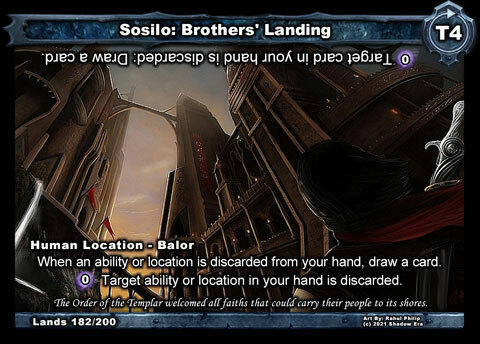 Some Locations have built-in effects for the opponent to take control of the Location. This causes the Location to rotate, switching the abilities on offer to each player. 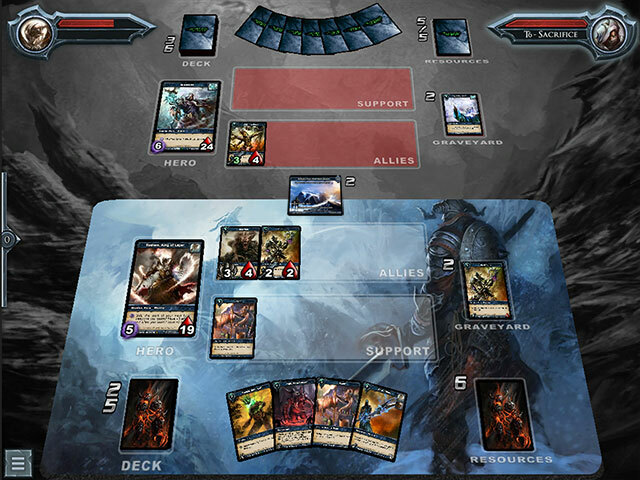 If you take control of a Location on your turn, you may still activate the controller ability even if you have already activated the non-controller ability. A single Location can repeatedly change control throughout the game. If some effect causes the top Location to leave play, the next Location in the stack becomes active again, with the same controller as it had when it was covered. That's it for Location rules, though I'm sure there will be more questions as more of them are revealed! In the mean time, I'm pleased to be able to share two more non-Location spoilers from the set. No prizes for guessing why they were chosen to be revealed in this article. Last edited by Gondorian; 06-12-2017 at 11:23 AM. So excited for the SE v3.0 delivery! I'll be interested in how well the AI utilises the locations in campaign mode. I don't envy the coders building the AI! Last edited by ShrapnelFox; 07-09-2015 at 10:38 PM. Let's get this done! Looks like great fun to change the whole game from Cotc up! Can u make it so we don't have to read upside down? For both parties? Yes, we've talked about this internally. One option is to essentially have 3 versions of the card image, all with the relevant parts in the same place, but just different vertical flips on different parts - one as you have already seen; one with everything correct orientation for controller; one with everything correct orientation for opponent. The hover-zoom could use one of the latter two (dependent on which player controls it) or it could just use the relevant one all the time on the board. Another option is to have the hover-zoom just show the card twice, side by side - the controller view and opponent view. We figured this was the kind of thing to wait for community feedback on, so thanks for getting the ball rolling. Looks pretty cool. Liking the other new spoilers there too. Looks like the hero Life meters have also been updated for the future, even helping indicate the turn so you know when you can play your Location more easily. I do still think the card layout for Locations look slightly weird. Maybe it's just me, but the card doesn't look the same size lengthwise as normal cards, which means they would look weird in your hand (unless the digital game makes them change size). Or maybe it's just my eyes playing tricks and it just looks a different size since it's horizontal. One "nerdy" question, why Unaxio Bannerman text says: "While an ability..." and not "If an ability..." ? If all the locations are played in a community pool, I'm guessing they just start there, and my opponent and I have the exact same number of and kind of locations , how does the game know which side or ability of the card to show me. .? I'll admit that "if" would also work in this case, but we're trying to stay as consistent as possible.